Join us as we spend the day exploring some of Scotland’s best bits! Will you catch a glimpse of the monster? Discover Scottish History, Beauty and Whisky all in one amazing day! Find where the Lowlands meet the Highlands! This tour is a must for fans of architecture and the Da Vinci Code alike! Marvel at the skill, ingenuity and mystery! Is it any wonder that Scotland is one of the world’s favourite tourist destinations? But there is so much for you to see and do how can you possibly cram it all in when you visit? That’s where the experts at Go Travel Scotland can help. 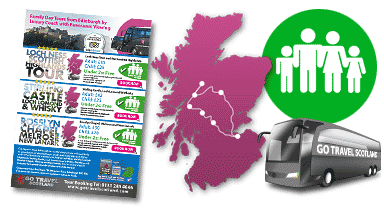 Using Edinburgh as your convenient touring base, our day tours can swiftly transport you and your family or group by air-conditioned luxury coach to some of Scotland’s top attractions including: Loch Ness and the Scottish Highlands, Stirling Castle, Loch Lomond and a Whisky Distillery; and Rosslyn Chapel, Melrose and New Lanark. That allows you to concentrate on enjoying the experience while we take care of the driving! Scotland has a long and dramatic history which has shaped its people as well as its beautiful landscapes and you’ll be able to capture a flavour of that on a luxury coach tour with us. From the lowlands to the highlands, there’s not a part of Scotland that will fail to amaze or delight you. Mountains, lochs, castles and beautiful scenery you will never forget. From ancient past to modern marvels, we look forward to sharing Scotland’s wonder and excitement with you! Keep our handy Day Tours from Edinburgh leaflet on your phone for easy reference wherever you are. It’s in interactive PDF format, so you can tap on buttons etc. to go straight to more information. 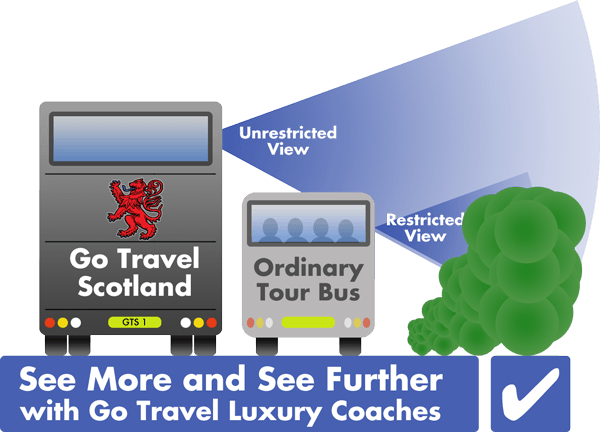 Why Choose Go Travel Scotland? As a privately run travel company, every member of our hand-picked team is eager to make our customers’ experience one of excellence throughout. Our passenger testimonials confirm this. We also endeavour to provide unparalleled value for money with our competitive prices. 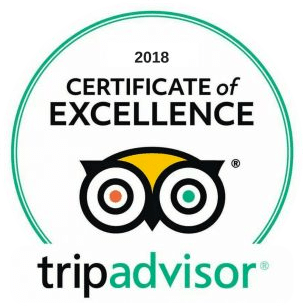 Our experience is wide-ranging too, which strengthens our ability to provide our customers with the reliable travel services they need, not just for Luxury Coach Day Tours, but for Private Coach Hire, Contract Services and our extensive Taxi Hire fleet too. We offer a private hire coach and driver service for large groups travelling from Central Scotland to anywhere in the UK. With a capacity of up 51 passengers, WiFi, USB and toilet facilities, our coaches are the best way to travel in comfort and safety. Get in touch with us for a competitive quote. If you have a requirement for the provision of regular and reliable transport services, do get in touch with us. We have extensive experience in providing safe and reliable transport for businesses, organisations and local authorities. Our taxi network of around fifty vehicles provides wide, prompt and reliable coverage in Lanarkshire and for destinations beyond. The fleet encompasses various vehicle types so your individual needs can be easily catered for. Need a regular service? Download our convenient App to use on your phone!